Sweetface has finally prevailed in getting me to finish writing down everything I have been trying to teach my granddaughters about homemaking over the years. These are things that I was taught by my Mother and Grandmother. Back in the day when I was growing up that was the main thing mothers did, teaching their daughters how to be devoted managers of their homes, day to day, year after year. It seems that today's busy lives exclude time for teaching a woman how to feel good about making a home. We all deserve to feel accomplished and successful at what we love--especially when we love making a happy nest for our family. That is what this little book is all about. Hopefully copies will make their way into the homes of many women and their daughters and granddaughters over the years. It will be, I think, a lovely gift for the new bride, as well. 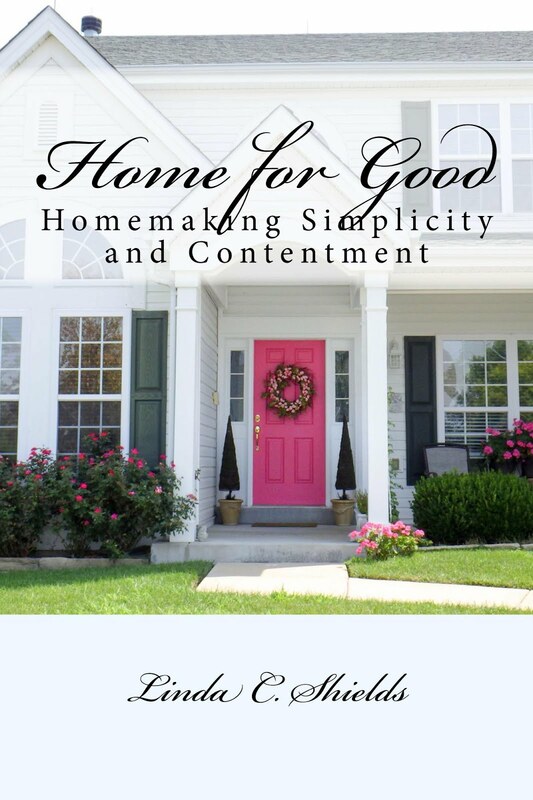 This week the paperback and the Kindle format of Home For Good was released. I am currently working at narrating the book for those who prefer the Audible format. I am eager to receive many (hopefully encouraging) reviews of the book on Amazon as soon as possible, because that will help its rankings, which will in turn help it to get into the hands of more women. You can read a preview of the book on Amazon if you click on the book icon on the right hand column on this blog, then on "Look Inside" on the Amazon page. If you didn't already know this, I am a true believer in the importance of homemaking. It is a high calling, worthy of praise, for any woman. And it is no small task, requiring more skill and intelligence than many acknowledge. Where do you go to learn how to keep your home organized, efficient, and beautiful these days? Who can tell you how to do it all with a minimum investment of time and energy? How do you make yourself a priority? Hopefully, this volume will provide all of that and more for its readers. If you, too, love making a home, I hope you will be one of them. Oh Linda! Congrats!! I am definitely a buyer and can hardly wait to start reading! The cover of your book looks so professional and attractive. I can't wait to get my hands on a copy. I hope that you will have great success with it. Sorry I left out a word above. I was saying I am glad you like the appearance of the book, as I had a lot of great help with it. I took the photo of our front door, but that was the least of the work that went into it. Congratulations on your newly released book! Your writing, in your book and on your blog, is meaningful, as well as beautiful, and is written with graceful confidence. Congratulations Linda! What an accomplishment. Yes, if you email me at HomebodyHeaven@gmail.com with your Paypal email address I will send you an invoice at the same price currently on Amazon. But sure to add your full name and mailing address and I will get it in the mail within 24 hours, signed and dated. Email sent! I can't wait. Speaking of books. I remember you once posted about some books that you like to read and re-read..You mentioned you loved them, about women going through challenges, persevering, etc..something like that..I can't recall. I tried searching the blog but couldn't find them. Do you remember the titles? Oh let me think; One of my favorites is "Hinds Feet On High Places" by Hannah Hurnard Smith. Another is "The Practise of the Presence of Christ" by Brother Lawrence. I hope that gets you started! Thanks for asking. By the way, I replied to your email separately, Margaret--please check your spam folder?